Sterling Silver And Blue Lace Agate Statement Ring. Striking sterling silver and blue lace agate statement ring, with scalloped edging. UK size J 1/2. 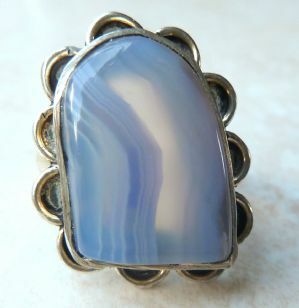 A large sterling silver and blue lace agate ring. The ring is set with a free form blue lace agate stone, bezel set. Around the agate is a scalloped edging, set onto a plain silver band. Stamped 925 for sterling silver to the inner side of the band. The ring is a UK size J 1/2, USA size 5 1/2. Sterling silver ring with free form blue lace agate cabochon. Striking modrn large silver and blue lace agate ring. Blue Lace Agate Gem Stone Chip Bracelet. Blue lace agate gemstone chip stretch bracelet.